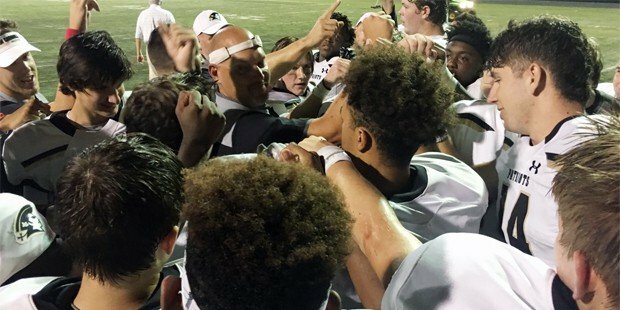 Pictured above: John Carroll School, with coach Ken Brinkman in the middle, breaks the huddle after Friday’s victory over Bel Air in the second annual Battle of Bel Air. 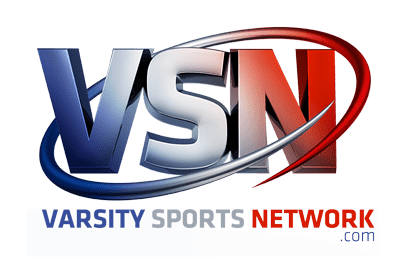 The 3-0 Patriots are tied for 20th in the newest VSN Football Top 20. With MIAA B Conference play set to start this weekend, John Carroll School was impressive in its non-league warmups and is a legitimate contender to reach the final in November. The Patriots are the newest entrant in VSN’s Football Top 20. The Bel Air private school is tied for 20th after beating their public school rivals in the Battle of the Bel Air, 27-0. Bel Air was coming off a close loss to Prince George’s County’s Charles H. Flowers, ranked in the state media Top 25 poll. There’s no change at the top of the poll with St. Frances Academy at No. 1, followed by Archbishop Spalding, Broadneck, Calvert Hall College and Milford Mill Academy. Mount St. Joseph, Dunbar, McDonogh School, Glenelg and Howard makes up the rest of the Top 10. This week brings two Top 20 matchups with No. 18 Arundel visiting defending Anne Arundel County champ and third-ranked Broadneck while Baltimore City rivals seventh-ranked Dunbar and No. 13 Mervo collide at Art Modell Field in northeast Baltimore. Last week: The Panthers did not play. Last week: The Cavaliers defeated Bishop Moore (FL), 41-18. Last week: The Bruins defeated Severna Park, 34-17. Last game: The Cardinals defeated Prince George’s County’s Riverdale Baptist School, 23-13. Last game: The Millers defeated Randallstown, 50-0. Last week: The Gaels defeated Silver Oak Academy, 48-6. Last week: The Poets defeated City College, 46-0. Last week: The Eagles lost to Malvern Prep (PA), 19-3. Last week: The Gladiators defeated Oakland Mills, 49-12. Last week: The Lions defeated Mount Hebron, 42-0. Last week: The Patriots defeated Meade, 39-6. Last week: The Owls lost to Linganore, 48-7. Last week: The Mustangs defeated Poly, 36-0. Last week: The Indians defeated Smyrna (DE), 28-14. Last week: The Rams defeated Joppatowne, 39-12. Last week: The Cobras defeated Aberdeen, 35-0. Last week: The Lions defeated Williamsport, 37-21. Last week: The Wildcats defeated South River, 42-20. Last week: The Warriors defeated Perryville, 45-15. Last week: The Wildecats defeated Centennial, 45-0. Last week: The Patriots defeated Bel Air, 27-0.